Kerry is a talented painter and art instructor. 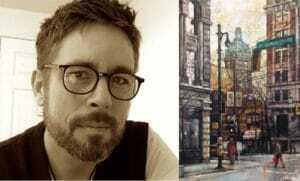 He is best known for his portraits and urban landscape paintings. Kerry has worked as a draughtsman, a graphic designer and illustrator. Having to clearly communicate a specific message and imbue it with feeling, Kerry found it was his experience in the commercial realm of art that helped him develop his representational and uniquely expressive style. Kerry has been teaching beginner to advanced painting courses since 2001, and has worked with various ateliers, schools and painting groups, such as VCAD and WPGA. Kerry is a senior painting instructor at AOMA.